Some time ago I announced on the website that I was going to illustrate the benefits of a Ballpark E-Guide with the new Yankee Stadium Challenge… meaning finding cheap Yankees tickets, cheap Yankees parking (or other cheap means of arriving at the ballpark), or cheap food at the shiny and expensive new Yankee Stadium. Cheap at Yankee Stadium? Am I being serious? Yes, I am. The new monument to lots of money. As I stated, you don’t often hear the word “cheap” associated with anything baseball, Yankees or New York City. Most people groan at the thought of what it will cost them to see a game at baseball’s majestic home of the most successful team in North American sports history. Yankees tickets can be over $1,500 for one game, parking at Yankee Stadium as of this writing is $35, and a beer will run a fan as much as $11. And that’s not counting having to drive on Turnpikes and to cross bridges that often require ridiculous tolls, if you’re coming from anywhere but inside the city limits. The shade away from the bleachers costs about $50. Most fans just think they need to accept this or maybe think that it’s worth it to see the Yankees. For all of this supposed gouging, the seats and parking lots are still full, and there’s still lines at the concession stands. But I decided to take on the challenge of seeing a Yankees game as cheaply as possible, using tips from the Yankee Stadium E-Guide and on the Ballpark E-Guides blog. Little did I know what a challenge it would really turn out to be. I picked the absolute worst game of the season to try this. The challenge was actually planned months ago. Sometime in April, July 10 became the date, which I then revised to July 9 for family matters. 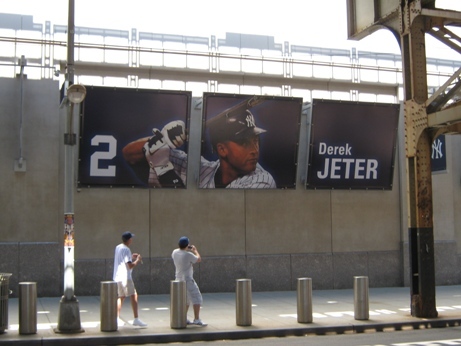 And as you all know, on July 9, Derek Jeter clouted a home run to etch his name on the 3,000-hit list that day, the first Yankee to do so. Folks, long story here, but it’s a great story, and it includes a lot of advice, so stay with it and I’ll try to make it worth your while. A few days before the game, I had not yet bought a ticket, not having anticipated that the Captain would be returning to the lineup and closing in on history. Even so, I was following Ballpark Savvy’s advice, and waiting until just before game day to buy a ticket. Generally this works fairly well; as game day approaches, the supply increases and the price usually comes down. But as stated in the E-Guide, you can’t count on this, for precisely this reason. I decided $40 would be as high as I would go for a ticket. On Friday afternoon a ticket became available on StubHub for $41. The last single digit Yankees number. I was encouraged by the drop, but refused to pull the trigger. Then, as I thought might happen, late in the afternoon people began coming home from work and buying, and tickets below $60 disappeared. Then Friday night’s game was rained out and postponed, leaving Jeter stuck at 2,998 hits, and me now really in a bad way. Ticket prices for Saturday’s game soared. StubHub’s cheapest ticket was now $90 for standing room and even more for obstructed view, and would remain at that price all night. 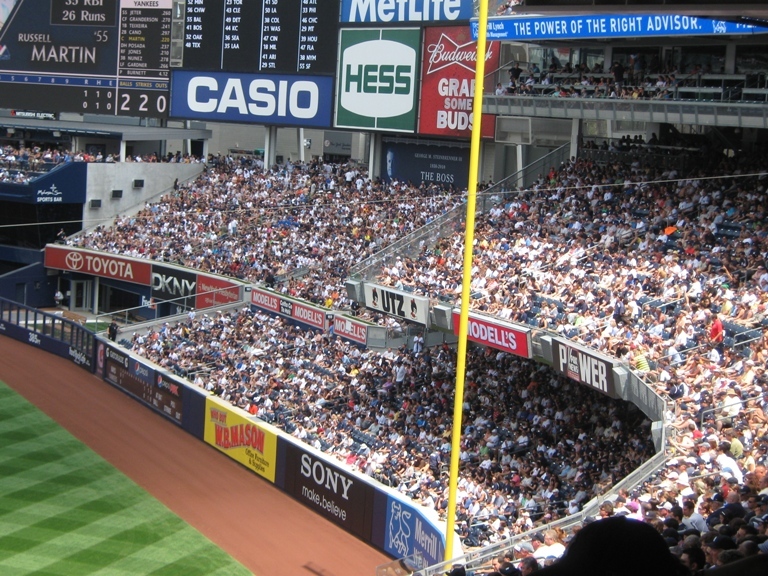 Yankee Stadium Tightwad Tip #1: When using StubHub or other third-party broker, set a realistic low that you want to pay, and when you see something you can live with, grab it. For high-demand games, expect the price to rise in the evenings, when folks are home from work and online. Well, okay. Here I am, ticketless. I’ll get back to that. But now let’s talk about actually getting to Yankee Stadium on the cheap, also no easy thing. You won’t often see this few cars on this bridge. Must have been 5 AM. If I were to drive straight to and park at Yankee Stadium, coming from South Jersey, I would have used I-295 to exit 7A of the New Jersey Turnpike, and then crossed the George Washington Bridge into the city. That route is, according to Mapquest, a 118-mile drive from my front door. The bridge is $8 (free into NJ). Turnpike tolls total $12.50. Gas would be about $45, assuming no traffic…ha ha. Parking at Yankee Stadium is a whopping $35. That’s over $100 for round trip and parking. So if I try taking the NJ Transit train from Hamilton to Penn Station, that at least takes out the absurd parking fee. This is just a 50-mile ride, with no Turnpike tolls. Parking at Hamilton Station is $7, and the train to Penn Station is $30 round trip for an adult. From there the B or D train to the Stadium (or the E to the B/D, which is a free transfer) is $4.50 round trip. So with gas being about $19 now, that’s a total of just over $60. Much better. Fortunately there are cheaper bus options, most notably Megabus and Boltbus. Both services offer great fare prices to get from one big city to another; Megabus is a bit cheaper and has a wider reach, but for some reason Yelpers seem to think Boltbus is better about service. I can’t say, but I do know that I saw two Megabuses show up while waiting for the Boltbus, so they can’t be that bad. The Boltbus I used was $23 round trip, including the booking fee. Add to that about $7 for gas getting to a train station in New Jersey, and $7 for the round trip train ride that took me to the bus stop. Then the $4.50 for the E-D train brings the total to about $42…not much more than parking at Yankee Stadium, and less than half what the original plan would have cost. Believe it or not, people do pay twice what they need to. 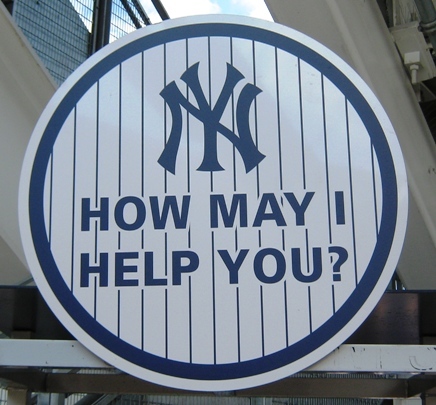 Yankee Stadium Tightwad Tip #2: If you’re coming to New York City (or Chicago, Philadelphia, Boston, etc.) from out of town and you’re close to another metropolis, by all means look into Megabus or Boltbus. The savings are large, and it’s not a bad ride at all. 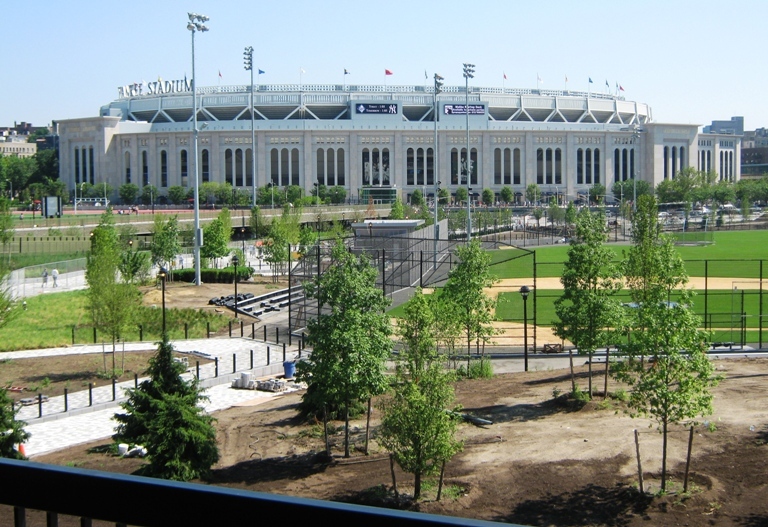 Now, obviously this wouldn’t work as well for more than one person; if you want other options for getting to the game, there are plenty in the Yankee Stadium E-Guide. You can save money bringing others, too. So of course now you’re thinking, Kurt, this is all fine and well, but what good is getting there cheaply if you don’t have a ticket for the game? Did our hero make it inside Yankee Stadium? Was he able to witness in person a first in Yankees history? Did he finally cave in to reality and go deeply into debt for a once-in-a-lifetime experience? Click here for Part 2 of Mr. Smith Goes to New York City!